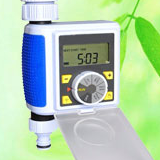 China Huntop is leading China factory manufacturer supplier of Digital LCD Automatic Electronic Water Timer HT1085. Also manufacture supply wide range of garden tools watering irrigation products. Welcome to inquiry and order Digital Large Screen LCD Automatic Electronic Water Timer.